In honor of this past Fourth of July weekend, and also to pay homage to my hometown of Philadelphia, Pennsylvania, I bring you a series of items inspired by our most patriotic seamstress. Although there is a bit of controversy regarding who exactly did make the first flag for the, then new, United States of America, I blissfully work under the assumption of Betsy Ross as the creator of our Stars & Stripes. No one does quirky, Americana better than iconic fashion designer, Tommy Hilfiger. Jourdan Dunn, Jacquelyn Jablonski and Toni Garrn model as sailors, socialites, and Cape Cod wasps, posing in nautical (undeniably patriotic) looks. The man credited with designing the current 50 star American flag is Robert G. Heft. The exact red, white, and blue colors to be used in the flag are outlined in the CAUS Standard Color Reference of America, 10th edition. Specifically, the colors are “White”, “Old Glory Red”, and “Old Glory Blue”. Since 1777, the flag design has officially been modified 26 times. Without being too literal, peruse items inspired by the freedom of my great country – particularly salient as the daughter of an Israeli immigrant, and the fiancé of a second generation Moroccan immigrant. America, I salute you – melting pot of the world. // 1 – Nothing is quite as American as Apple Pie ala Mode with Vanilla Ice Cream (and if you’re a real traditionalist, cheddar cheese). This unique frame print is called Americana and is by the artist K. THRO via Society6. // 2 – Picnic Pie Set with 10 forks, 10 parchment rounds and twine from Anthropologie. // 3 – Limited Edition Miss Statue of Liberty by Merci Gustave from AhaLife. The great irony of the Statue of the Liberty—the symbol of American liberty and independence—is that it is just as French as it is American. // 4 – You’re a grand old flag, you’re a high flying flag even when sitting atop this Star Spangled American Flag Kilim Cube pouf ottoman. A striped, starry blend of earthy wool and recycled jute from Kathy Kuo Home. // 5 – Put your patriotic style on display with this colonial inspired, metal, tea-light candle holder from Kohl’s. 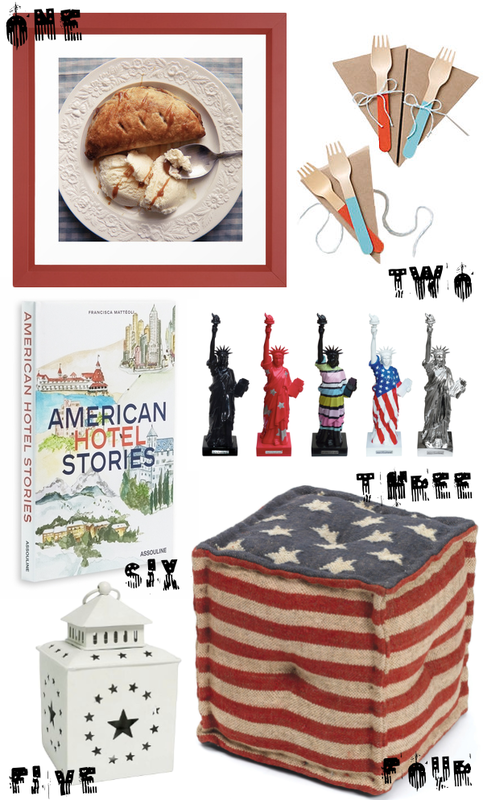 // 6 – American Hotel Stories coffee-table book by Francisca Matteoli. From Big Sur to Boston, this enticing volume follows in the footsteps of Jim Morrison, Marilyn Monroe, Tennessee Williams, Al Capone, Clint Eastwood, and some of America’s most famous personalities and hotel guests – from Assouline.